Nigeria is a country where numerous citizens have value for education. In Nigeria, people believe that being educated is one of the keys to being prosperous in life. As a result, parents and guardians are known to invest as much as possible in the education of their wards. Furthermore, most people believe that the minimum qualification any child should get is SSCE. In the country, we have thousands of schools, some fall in the expensive range, some in the moderate range, and some in the cheap range. However, this article is concerned about the most expensive schools in Nigeria. British International School is one of the most expensive schools in the country. The school is a multinational as well as an international school. It was established in 2001. The school runs both the British and Nigerian curriculum. Facilities this school boast of, include multi-purpose hall, music suites, theatre, computer suites, science suites, tutorial rooms and swimming pool. The annual fee for this school is about 4,480,000 NGN. This annual fee includes school fee, feeding fee, uniforms, and textbooks. Note that students of this school pay in US Dollar. British International School is located at Landbridge Avenue, Oniru Private Estate, Victoria Island, Lagos. Here comes another British-Nigerian school in the country. Lekki British International School is an international school that runs both the British and the Nigerian curriculum. The school which was established in 2000, is both a day and a boarding school. The hostels at the school are first-class hostels. Other facilities in the school include air-conditioned classrooms, internet-connected desktop computers, well-equipped laboratories and theatre room. 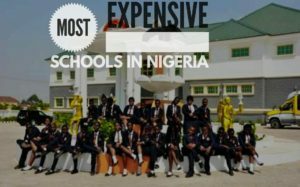 The annual fee for this school is about 4,000,300 NGN, making it one of the most expensive schools in the country. The annual 4,000,300 NGN includes all fees required to be paid by a student of the school. Lekki British International School has its presence at Victoria Arobieke Street, off Admiralty Way, Lekki Phase 1, Lagos. Unlike British International School and Lekki British International School which are located in Lagos, Day Waterman College is a school located in Abeokuta, Ogun State. The school runs the Nigerian educational curriculum. Not only is Day Waterman College one of the most expensive schools in this country, but it is also one of the best in the country. Day Waterman College is a boarding school, and their hostels are first-class hostels. The school is primarily for secondary school students between the ages of 11 and 16 years. Furthermore, the environment where the school is located is very conducive to learning. Day Waterman College exists on about 35 hectares of land. The annual fee for this school is about 3,700,000 NGN. Whiteplains British School is a British school located in the capital of the country, Abuja. This school runs only the educational British curriculum. The school has been operational for over 15 years. Students of the school pay about 3,600,000 NGN on an annual basis.